I made this to try out some Hexagonal Thinking activities. The colored tags could be used for different concepts within the thinking map such as: potential solutions, resources, people involved, or anything else that makes sense in your activity. 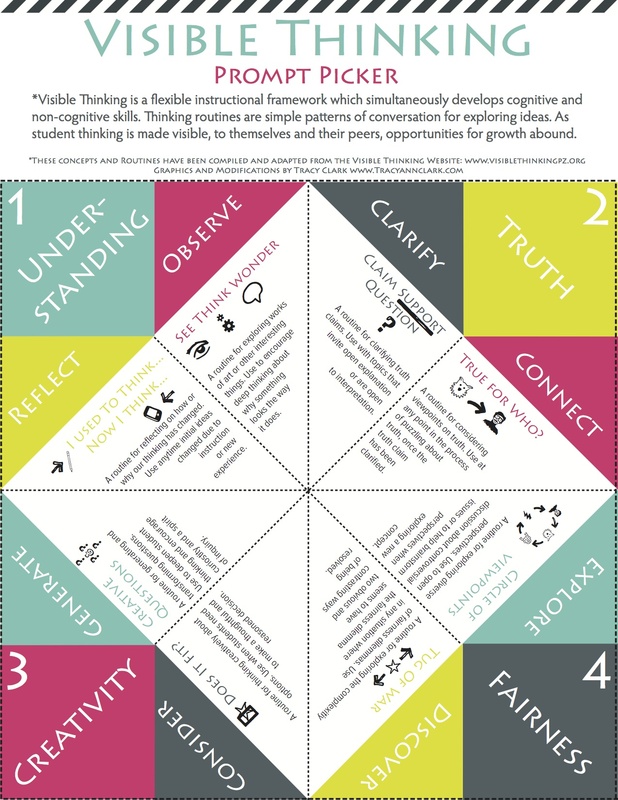 Hexagonal Thinking is simple yet powerful. 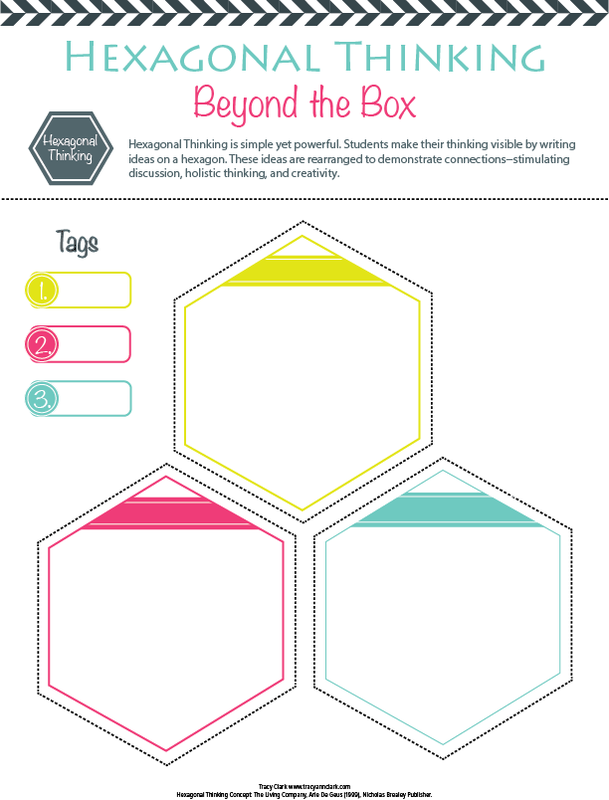 Students can make their thinking visible by writing ideas on a hexagon and forming connections. As groups rearrange the hexagons in a variety of ways, they begin to see how others view the world–the very definition of empathy. 3. It brings new ideas to light. 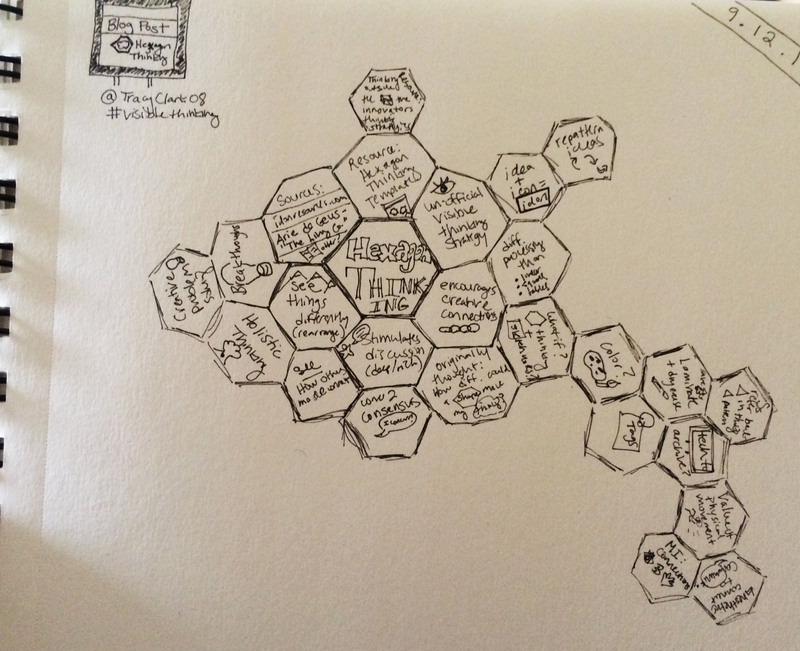 I wasn’t convinced of this until I tried it, but the shape of the hexagon itself allows for more creative connections due to the number of sides and the way your eyes and brain search over the whole thinking map to seek connections. When you make a list or work in boxes, the linear thinking that follows can be quite effective and speedy, but for creativity–hexagons win. 4. It stimulates rich discussion. Communication skills are strengthened since the thought experiment ideally requires collaboration. Students must communicate and petition one another while they reposition ideas and ultimately come to a consensus. 5. It makes big problems digestible. The original context for hexagonal thinking as far as I can tell was actually in the corporate world. Author, Arie de Geus wrote about using the problem solving strategy in his book, The Living Company. Bite-size pieces not only help solve corporate headaches, but also give students structure and space to make sense of big concepts. 6. It gets students moving. Discussions can get pretty lively as students reposition different hexagons to represent new connections. 7. It gives everyone a voice. Students who may not feel comfortable responding to a question in front of the whole group are able to contribute and discuss connections in smaller groups as the map unfolds. English language learners and students with exceptionalities can participate at their level of comfort too. 8. It is not reserved for a specific content area or age group. The driving question could be related to any topic for any grade level. Just be sure to have a question or problem with enough meat to stimulate a variety of perspectives and solutions. 9. It can become a visual support for future learning. 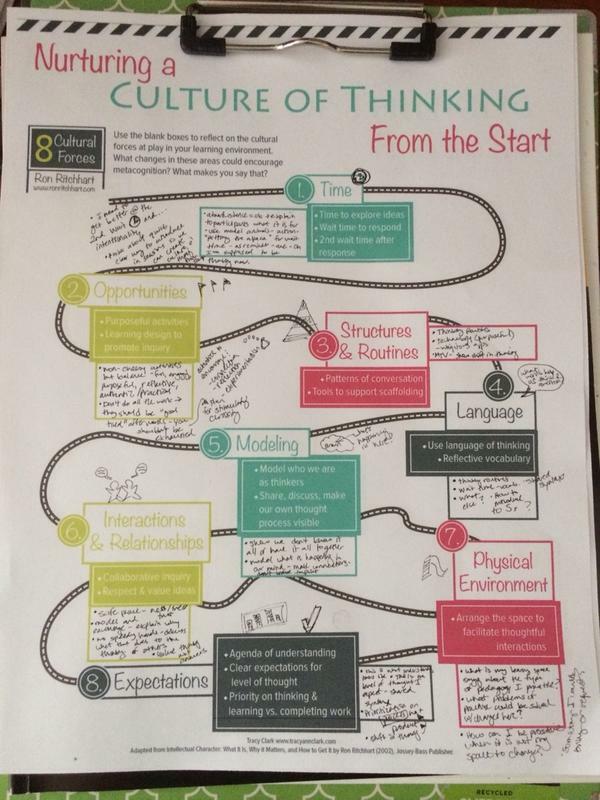 Students can refer back to the thinking map either as a visual on the classroom walls, or as a digital artifact. This can help bring back mental models around the concept or inspire new connections, continuing learning on topics far beyond their scheduled coverage time. 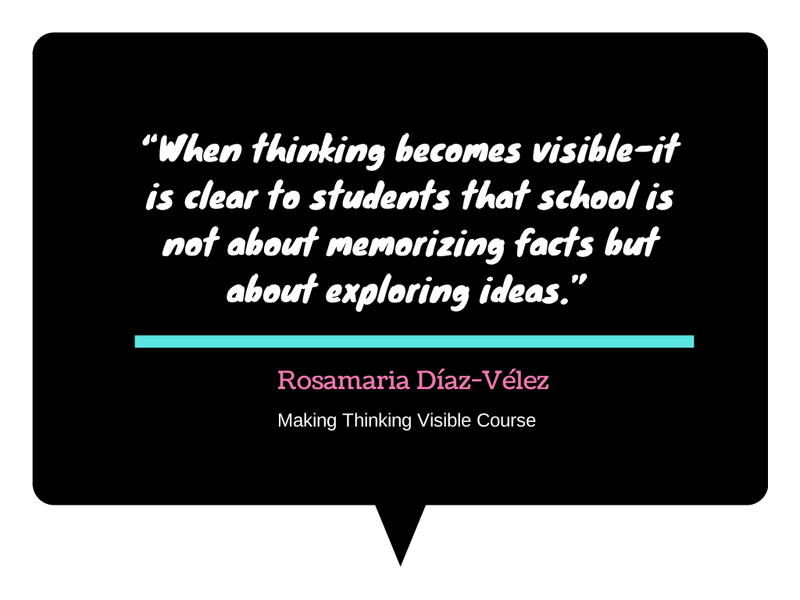 The physical act of writing down an idea and placing it into the connected thoughts of peers is powerful and supports not only individual metacognition, but also nurtures a collaborative culture of thinking. 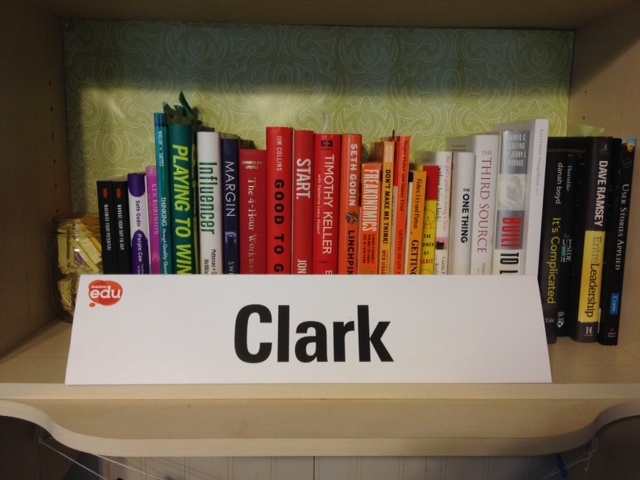 It might be a strange memento, but my SXSWedu nameplate has been sitting on my desk since the conference ended on March 6th. It serves as a reminder. 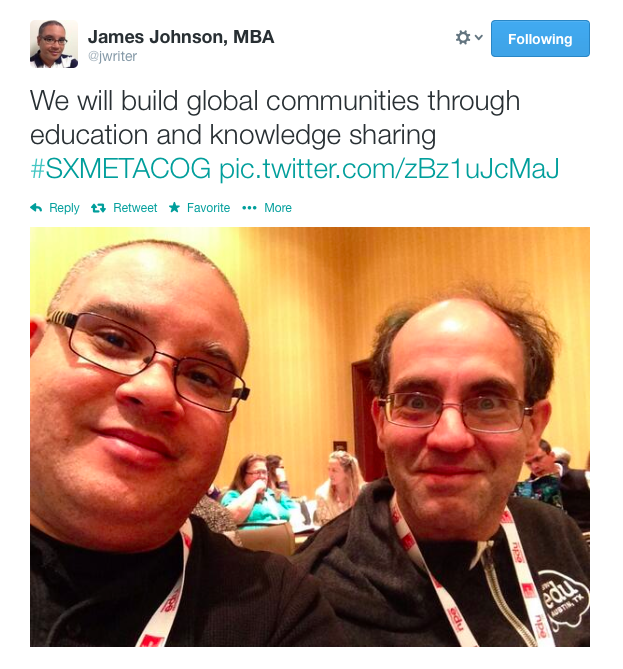 A reminder of the things I learned this year and a reminder of the commitment I made to action with my original co-presenter, Greg Garner, and a room full of people tweeting to #sxmetacog. 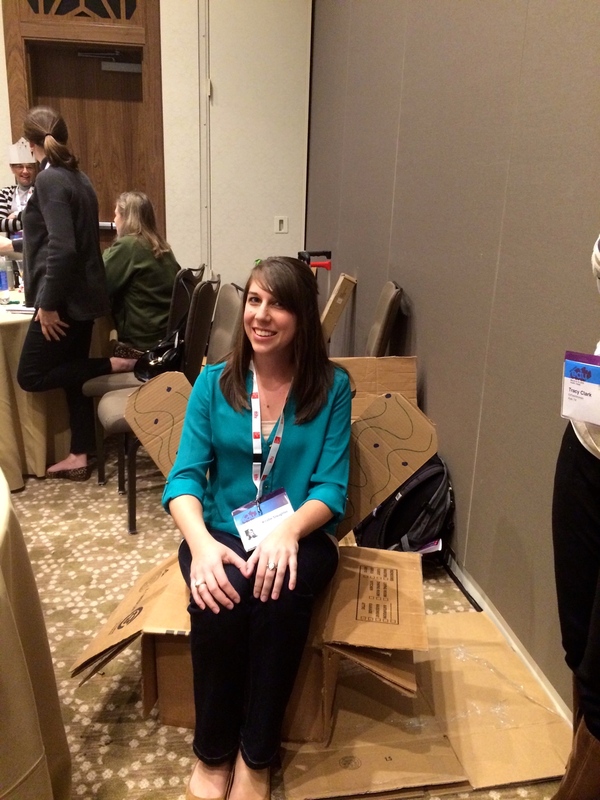 I was inspired to scrap almost the entire structure of our presentation the night before, after taking part in the EdTechWomen dinner, an awesome event put on by the national organization and our local Austin chapter. Of course when I got into a room with such a diverse group of interests, passions, experiences, and perspectives, I wanted to remain in this Neverland forever. The conversations were powerful, indeed, and left me desiring another opportunity to learn, grow, and be pushed by the people who had traveled to Austin in search of something bigger than themselves. I left Uncle Julio’s that night determined to use our time the next morning to create and facilitate this type of experience. Redoing a presentation the night before is not necessarily best practice or a habit to engrain, but in this case, the learning opportunity that emerged was worth far more than the missed sleep and frazzled nerves that accompanied a nascent presentation in front of lots of smarties. I won’t go too deep into our content here, if you want to get the idea you can check out our Smore. But what is still making me smile a couple weeks later, is the authentic, collective conversation and connection that occurred amongst a random group of incredible people. It was as if they were just waiting for someone to pull the release valve, to be given permission to speak, share, and connect in an authentic way with those around them—that is… beyond the last five minutes at a solo microphone in the center of the room with all eyes staring at them #nooffenseifudidthat. We knew we wanted to facilitate an active learning session, but what we did not know was how well this desire would mesh with the desires of those who showed up. 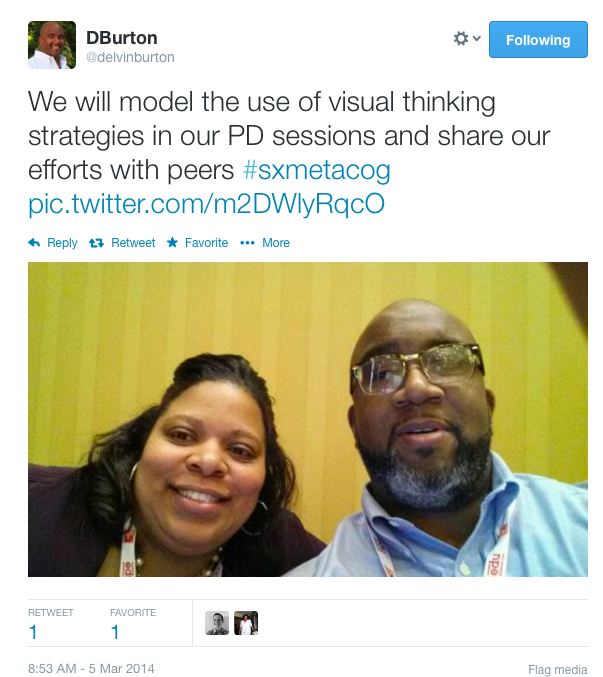 Learning alongside our peers, we experimented with Visible Thinking strategies, tweeted “headlines” representing our individual SXSWedu experiences, thought about what we want our students to be like and reflected on a shift in our thinking about what needs to take place in order for educational innovation to occur. And just when we thought we had pushed them to their cognitive capacity, (since it was day 3) we asked them to take one more step. You see, I went into the conference remembering distinctly my inspiration after last year– I thought I could fly. Then reality set in and the day to day normalcies slowly ate away my inspiration. This year, with wild, sparkly eyes once more, I wanted to capture that energy and commit to doing something with it. I didn’t want to go it alone either. 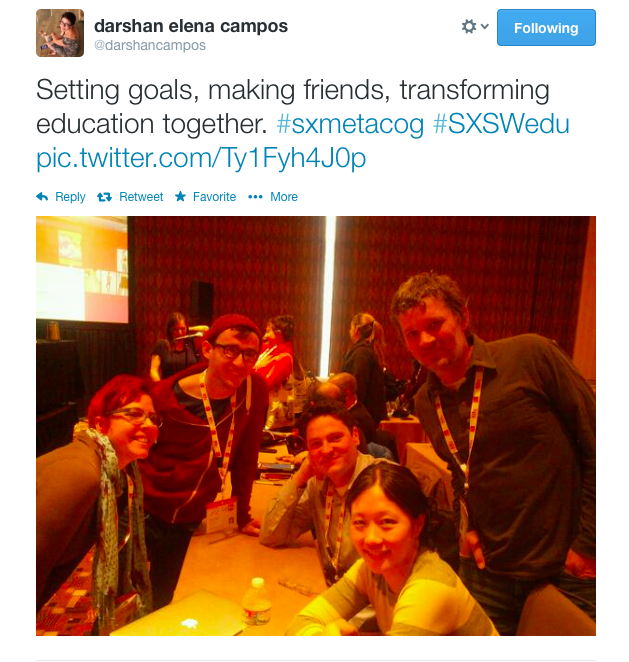 So, our last request was to connected with someone in the room who could help you and/or you could help them accomplish something to move innovation in education forward. 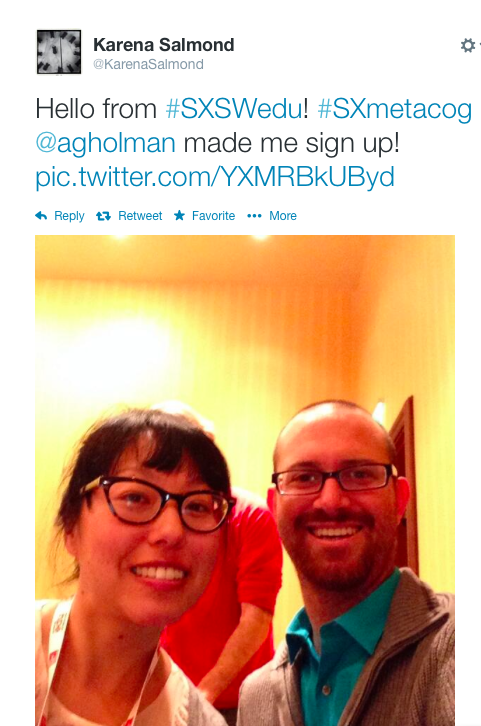 Then they were asked to take a “selfie” with that person and Tweet out what they were going to do. Maybe our kids are just waiting for someone to pull the release valve too…. So what about you? 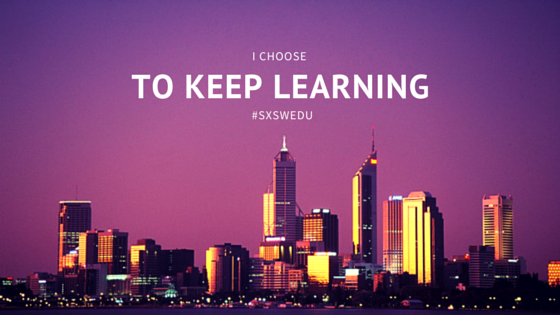 How are you going to encourage thinking and do something to move innovation in education forward? 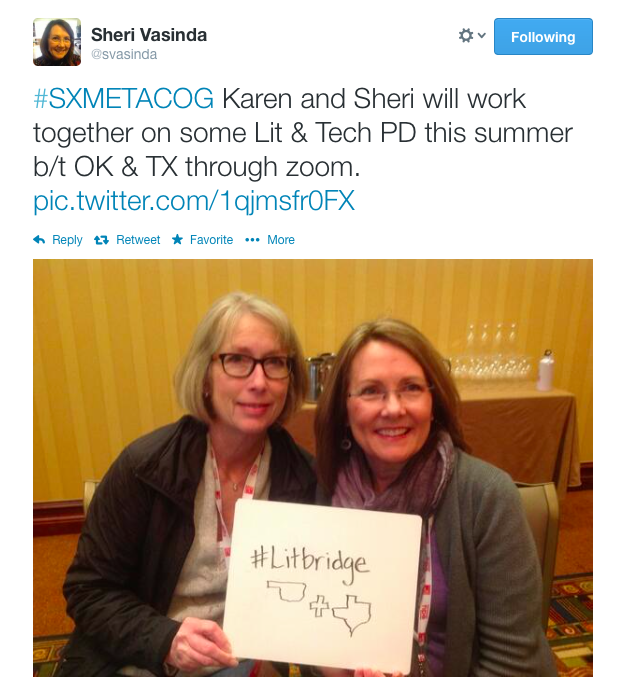 Tweet to #sxmetacog and let’s keep the momentum going!